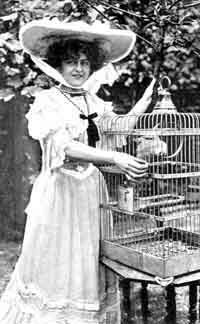 Encouraged by Sylvia's response to the doves, Jeremy presented Miss Purefoy-McKinlay with a large African Grey parrot as a means of beginning a conversation when they encountered each other strolling outside the Crystal Palace at Penge. The bird's history caused her some little inconvenience however, for it had once been owned by a certain Hugh Smollette, a retired sea-captain late of the Tasman sea. In consequence the bird would punctuate long, gloomy silences with the word 'Scrotum!' screamed in baleful and demonic tones, a practice which caused passing pedestrians to blanch when Lucinda promenaded along Bond Street with the parrot perched regally upon her shoulder. Upon one such occasion she attempted to remonstrate with the bird by tapping it firmly upon the beak, at which it retaliated by nipping off the lobe of her ear and fouling her jacket. Galvanised by pain she flung the parrot from her, all the while blaming Jeremy for her 'atrocious pain and embarrassment', and threatening a series of lawsuits which were eventually settled out of court for an undisclosed sum.